Core Aeration | Fairway Green Inc. 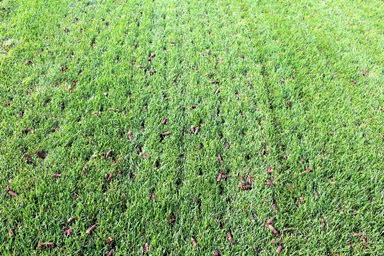 The simple answer is core aeration reduces soil compaction, thatch build up, and promotes healthy root growth. Soil compaction and heavy thatch build up can greatly reduce the flow of water and nutrients into the soil. This results in reduced uptake of water and nutrients, lower oxygen levels in the soil and poor root growth. During times of stress, like the hot and dry summer we just had, plants with a poor root system will be less tolerant to stress and more susceptible to disease. 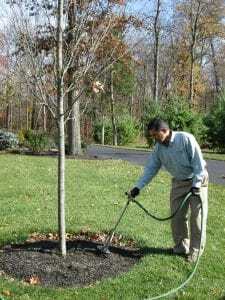 Core aeration is an environmentally sensitive and organic approach to having a healthier lawn. Why is my soil compacted? Soil compaction occurs over time through everyday use such as mowing, foot traffic, and recreational use. Even without traffic, natural processes such as rainfall and soil settlement will cause compaction. The impacts from compaction are more evident in parts of your lawn that are frequently used, such as near a play set or in front of an access gate for people with fenced in yards. In these areas, you will notice thinning and the development of bare patches over time as a result of soil compaction from consistent use. 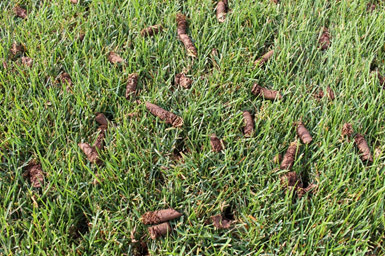 Core aeration works by mechanically removing plugs of soil from the lawn. 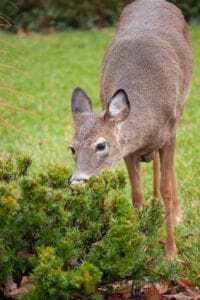 This will immediately improve water and nutrient flow deeper into the soil, as well as promote root growth for a healthier, more stress tolerant plant. Other benefits include increased oxygen levels to the soil, improved soil pore space, reduction in thatch build up, and enhanced response to fertilizers. The photo above was taken after aerating a customer’s lawn and shows the plugs that were removed. It may look unsightly at first, but the plugs will continue to break down over the next few weeks and be less noticeable over time. These plugs play two major roles in the breakdown of thatch layers. In addition to the mechanical removal of thatch, microorganisms located within the plugs will re-enter the turf from the top and help the decomposition of remaining thatch layers. In central New Jersey and eastern Pennsylvania, we recommend aerating from late summer through the fall as the turf will have less stress caused by heat and drought. In addition, at this time the grass plants will be growing and developing their roots while also having less pressure from weeds. Right after the core aeration is an excellent time to seed, assuming the temperatures have not gotten too cold. The open areas created by the core aeration are great sites for seed germination. For seeding, you would want to coordinate with us in advance so that your core aeration is completed during August or September. In summary, regular aeration is a necessary process for having a healthy lawn. For those of you that golf, you may be familiar with the process as golf courses aerate multiple times in the same year. Our recommendation to homeowners would be to aerate at least every other year, however an annual aeration would be ideal. Please feel free to contact Fairway Green if you have any questions related to core aeration or your lawn in general.